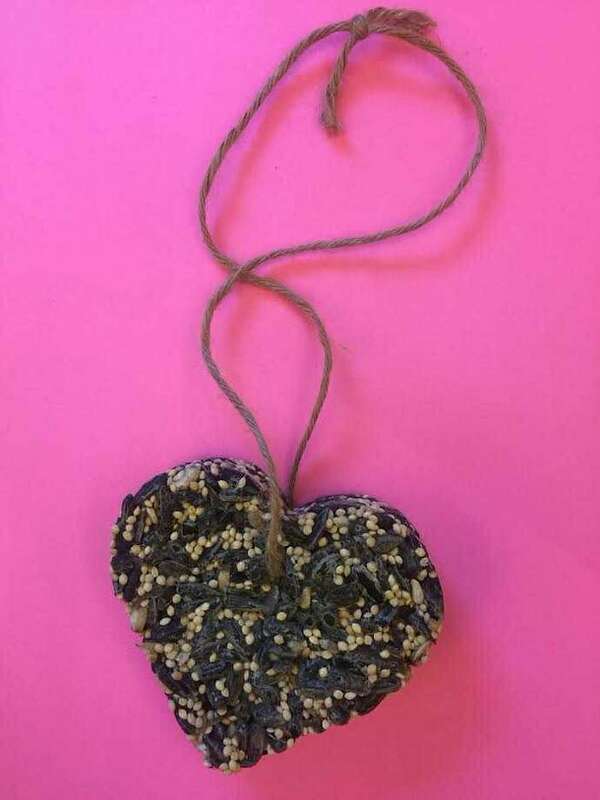 Birdseed feeders like this can be made at the Darien Nature Center's Valentine's Day party in Darien, Conn. on Feb. 11, 2018. DARIEN — Mystery is in the air this Valentine’s Day, at least in Darien. So is nature and an angsty spirit as different town entities prepare to celebrate the holiday in their own ways. The Darien Historical Society, the Darien Nature Center and the Darien Library are all planning unique events to celebrate the holiday of love, whether it’s the weekend before the Wednesday holiday or on Valentine’s Day itself. Starting Sunday, the historical society will be displaying love letters to Cate Raymond, a young woman who lived in the area during the Revolutionary War, in their exhibit “Cupid Goes Off to War: Notes of Passion and Praise.” While only seven letters are displayed in the exhibit, Ken Reiss, the society’s historian, said Raymond had no shortage of affection in her life as the letters represent several suitors. Raymond’s suitors range from a Continental Army soldier based in Garrison, N.Y., to a Loyalist living on Long Island, N.Y., at a refugee camp, chopping firewood for the British army. Another suitor, who had moved to Simsbury, was so smitten with Raymond, he also had two friends write letters to her on his behalf. For more information about the Darien Historical Society’s exhibit, visit darienhistorical.org. For more information about the Darien Nature Center’s event, visit dariennaturecenter.org. For more information about the Darien Library’s event, visit darienlibrary.org. The most notable letters come from a suitor whose name Raymond cut off the bottom of paper, causing speculation. Those interested in celebrating a less-traditional form of love on Valentine’s Day can turn to the Darien Nature Center or the Darien Library instead. According to the nature center’s executive director, Leila Wetmore, they will be hosting their first Valentine’s Day party this year featuring different types of crafts. Youngsters and their parents can go in to make nature-inspired Valentine’s themed crafts like a heart-shaped birdseed feeder, lavender sachets and valentines from items found in nature on Feb. 11. The nature center’s 40 animals will be available for play time. On Feb. 14 itself, teens at the Darien Library will have the option to take part in an “Anti-Valentine’s Day” party where they can decorate black heart cookies, listen to angry music and make non-romantic cards.